We have reached that time of year. You know, the time when it’s all about costumes, scary things, candy, tricks and treats. Unless you’re an adult. Then we’ve reached the time of year where the only scary thing in our calendars packed with all the seasonal things. And some crumpled minuscule package of sugar disguised as a treat that’s only big enough for an elf is just not going to cut it when it comes to tricking us into said packed calendars. Nope, this is a job for something a little bigger, a little stronger, a little tastier, and a little more sophisticated. Namely, chocolate covered beer caramels. Because, let’s be honest, this time of year is so nuts, why just drink your booze when you can eat it, too? That’s my theory and I’m sticking to it! Outside of that, these caramels are just plain delicious. They’re sweet, salty, a little chewy and have just a hint of booze. Like enough so you can taste it, but not enough to get you in trouble if you decide to eat a few of these at, say, your place of employment. Ah, the tricks and treats of being an adult, am I right?! You can use just about any beer you’d like to make these, but I would suggest going with something a little on the stronger and darker side. I chose one of our favorite’s, Allagash’s Curieux. Since it’s aged in bourbon barrels, and bourbon and caramel go so well together, I knew the hints of bourbon, along with the flavors of vanilla and coconut, would make for one epic explosion of flavors every time you put one of these caramels in your mouth. And then, if you decide to add the chocolate drizzle, I mean…game over. I’ll eat these for the rest of my days (which probably won’t be many if I’m subsisting on a diet of beer-infused caramels). If you want to get even more festive, these would also taste great with a pumpkin beer or spiced ale.I’d just make sure to skip the chocolate if you decide to use one of those types of beers instead. And another fun twist you can do to take these caramels up another notch (not that they need it) is to use smoked salt flakes instead of regular ones. What’s your favorite kind of halloween candy or treat? In a large saucepan set over high heat, bring 1 cup of the beer to a boil. Allowing to continue boiling, until it reduces into a thick syrup (there should be only about a 1 tablespoon of this mixture). Set aside. Line a 8”x8” pan with parchment paper and set aside. In a very large pot (think something with very high sides, like a soup pot), combine the remaining beer, the butter, cream, corn syrup and sugars. Set the pot over high heat and stir continuously until the butter has melted. Then, let the carmel continue to boil, untouched, until it reaches 245 degrees (which will take about 15-20 minutes). Remove the pan from the heat and stir the beer “syrup” from earlier into the carmel mixture. Pour into the prepared pan, then place in the refrigerator until the camels are set, about 2 hours. Also, if you’re not drizzling the caramels with chocolate, now would be the best time to sprinkle them with salt. Once the caramels have set, cut them into squares. If you’re drizzling them with chocolate, melt 3-4 tablespoons of chocolate chips (depending on how chocolatey you like your sweets). 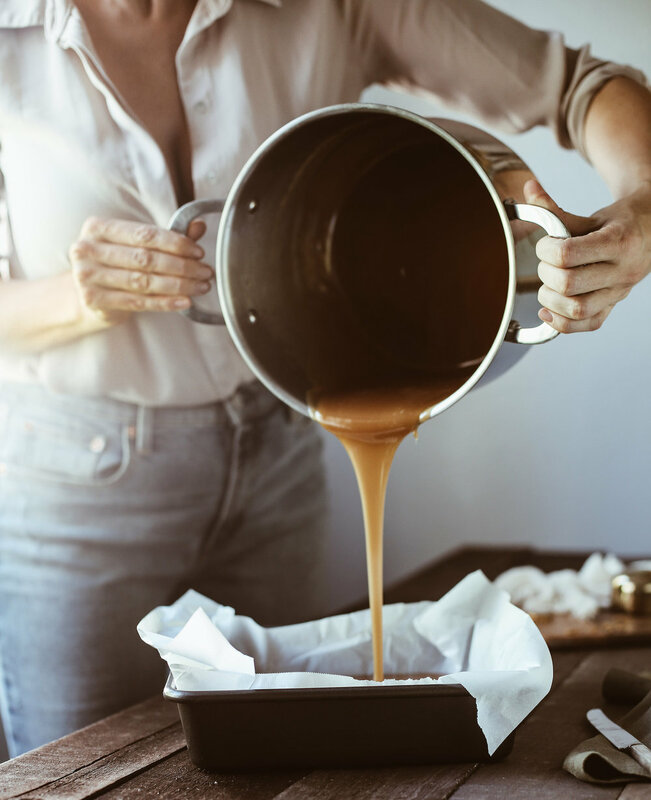 Place your caramels on a parchment-lined baking sheet, leaving a little space in between each one, then drizzle with the melted chocolate and finish with a sprinkle of salt. Pop them back in the fridge, just until the chocolate has hardened, then wrap them individually in pieces of parchment paper to store, or give out to friends and family.